(2) Direct Bolt-On, professional installation is always recommended. (3) Easy access and exit your car with extra protection and pre-inserted non-slip step on each side. (4) Black powder coated finish maximizes rust and corrosion protection. SURFACE FINISH- Made by ultra strong and heavy duty powder coated mild steel round tube for rust-resistant with UV resistant non-slip wide step pads. 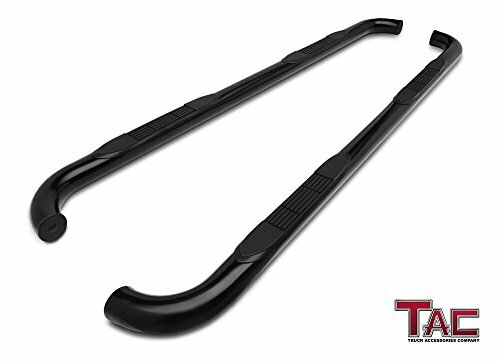 OUTSTANDING DESIGN – TAC side steps give your car outstanding appearance and extra protection, make you convenient to get in or out of your car. EASY TO INSTALL – Easy bolt-on installation. No drilling or cutting required. All mounting hardware and Installation instruction included.